“I know if I was a parent up there, I would be beside myself if my kids’ health could be at risk,” said President Obama on a recent trip to Michigan. “Up there” was Flint, a rusting industrial city in the grip of a “water crisis” brought on by a government austerity scheme. To save a couple of million dollars, that city switched its source of water from Lake Huron to the Flint River, a longtime industrial dumping ground for the toxic industries that had once made their home along its banks. Now, the city is enveloped in a public-health emergency, with elevated levels of lead in its water supply and in the blood of its children. President Obama would have good reason to worry if his kids lived in Flint. But the city’s children are hardly the only ones threatened by this public-health crisis. There’s a lead crisis for children in Baltimore, Maryland; Herculaneum, Missouri; Sebring, Ohio; and even the nation’s capital, Washington, DC—and that’s just to begin a list. State reports suggest, for instance, that “18 cities in Pennsylvania and 11 in New Jersey may have an even higher share of children with dangerously elevated levels of lead than does Flint. “Today, scientists agree that there is no safe level of lead for children and at least half of American children have some of this neurotoxin in their blood. The CDC is especially concerned about the more than 500,000 American children who have substantial amounts of lead in their bodies. Over the past century, an untold number have had their IQs reduced, their school performances limited, their behaviors altered, and their neurological development undermined. From coast to coast, from the Sun Belt to the Rust Belt, children have been and continue to be imperiled by a century of industrial production, commercial gluttony, and abandonment by the local, state, and federal governments that should have protected them. Unlike in Flint, the “crisis” seldom comes to public attention. In Flint, the origins of the current crisis lay in the history of auto giant General Motors (GM) and its rise in the middle decades of the 20th century to the status of the world’s largest corporation. GM’s Buick plant alone once occupied “an area almost a mile and a half long and half a mile wide,” according to the Chicago Tribune, and several Chevrolet and other GM plants literally covered the waterfront of “this automotive city.” Into the Flint River went the toxic wastes of factories large and small, which once supplied batteries, paints, solders, glass, fabrics, oils, lubricating fluids, and a multitude of other materials that made up the modern car. In these plants strung out along the banks of the Flint and Saginaw rivers and their detritus lay the origins of the present public health emergency. There is, in fact, a grim broader history of lead poisoning in America. It was probably the most widely dispersed environmental toxin that affected children in this country. In part, this was because, for decades during the middle of the 20th century, it was marketed as an essential ingredient in industrial society, something without which none of us could get along comfortably. Those toxic pipes in Flint are hardly the only, or even the primary, source of danger to children left over from that era. In truth, the United States has scores of Flints awaiting their moments. Think of them as ticking toxic time bombs—just an austerity scheme or some official’s poor decision away from a public health disaster. Given this, it’s remarkable, even in the wake of Flint, how little attention or publicity such threats receive. Not surprisingly, then, there seems to be virtually no political will to ensure that future generations of children will not suffer the same fate as those in Flint. A series of decisions by state and local officials turned Flint’s chronic post-industrial crisis into a total public health disaster. If clueless, corrupt, or heartless government officials get all the blame for this (and blame they do deserve), the larger point will unfortunately be missed—that there are many post-industrial Flints, many other hidden tragedies affecting America’s children that await their moments in the news. Treat Flint as an anomaly and you condemn families nationwide to bear the damage to their children alone, abandoned by a society unwilling to invest in cleaning up a century of industrial pollution, or even to acknowledge the injustice involved. 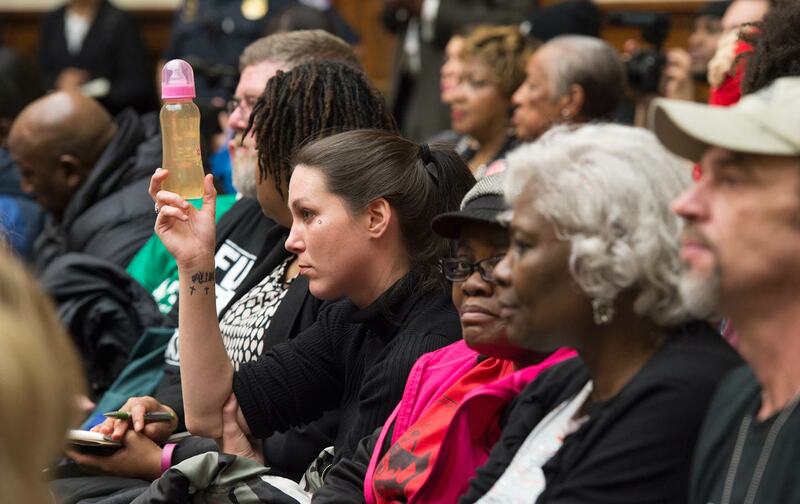 Flint may be years away from a solution to its current crisis, but in a few cities elsewhere in the country there is at least a modicum of hope when it comes to developing ways to begin to address this country’s poisonous past. In California, for example, ten cities and counties, including San Francisco, San Diego, Los Angeles, and Oakland, have successfully sued and won an initial judgment against three lead pigment manufacturers for $1.15 billion. That money will be invested in removing lead paint from the walls of homes in these cities. If this judgment is upheld on appeal, it would be an unprecedented and pathbreaking victory, since it would force a polluting industry to clean up the mess it created and from which it profited. David RosnerDavid Rosner is, with Gerald Markowitz, the author of Deceit and Denial: The Deadly Politics of Industrial Pollution and teaches at Columbia University. He served as an expert witness on behalf of the state in the Rhode Island case. Gerald MarkowitzGerald Markowitz is, with David Rosner, the author of Deceit and Denial: The Deadly Politics of Industrial Pollution . He teaches at John Jay College/CUNY. He served as an expert witness on behalf of the state in the Rhode Island case.